Well I have been a Vespa owner for a couple of months and it is great. 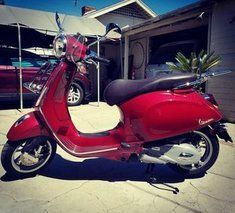 I am interested in making my vespa look like an original Vespa straight from Europe, so I started off with the Euro Light Kit. I made this kit myself and purchased some items from scooterwest.com which were the clear lens and plugs for the license plate mount. This is my first youtube video and I hope you guys enjoy. If you have any questions feel free to ask away. DOT really needs to update their rules to permit European turn signals on Vespas as they were designed at the factory for the European market.